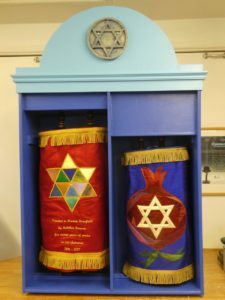 Have Ark, will travel-Anthony Fagin’s portable Ark which holds our two Torah scrolls, made its debut on Shabbat Mattot-Mas’ei on the 28th of Tammuz, where a Shehechianu was duly pronounced. The Ark, made of plywood with a ceramic crest on top, will be lighter and perfect for the upcoming High Holidays when two scrolls are required. Anthony’s expertise and fine craftsmanship resulted in the perfect solution for housing the two scrolls. Anthony donated the Ark to the KK community for which we are all very grateful. Bravo!